Welcome to The Invulnerable King, the first part in the epic Horned Lord and Moon Sow campaign for the Slaine roleplaying game. This campaign will take your players from Albion all over Tir Nan Og and beyond, as they quest to depose their tyrannical king, re-assemble an ancient stone circle and save all the norhtern tribes from the combined might of the Fomorians and the Drune Lords. 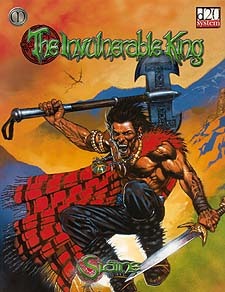 All you need to play The Invulnerable King is this scenario, a copy of The Player's Handbook, and the Slaine Rulebook. The first Slaine supplement, Tir Nan Og, would also be useful for additional background information on the various locations and people covered in the campaign, but is not essential. This scenario is intended for use as the first of a four-part epic campaign, though it can easily be adapted to stand alone. Requires the use of the Dungeons & Dragons Player's Handbook, Third Edition.